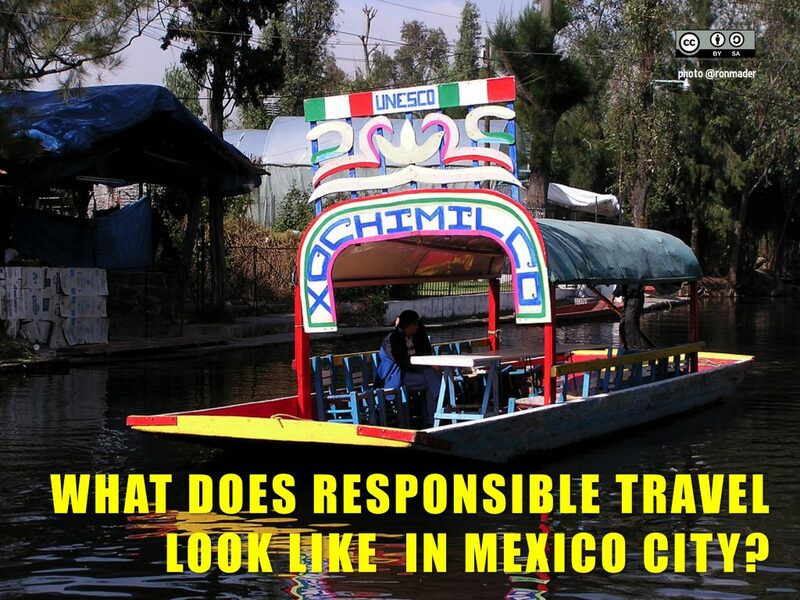 What does responsible travel look like in Mexico City? = ¿Cómo se ve un viaje responsable en la Ciudad de México? Mexico City – Xochimilco is a case study in sustainable tourism in a fragile, vulnerable landscape, also a veritable World Heritage Site. On my list of top places in the world to visit, Mexico City ranks at the top, and at the top of the Mexico City list are the canals and gardens of Xochimilco. Would would locals like visitors to know about Xochimilco? Travelers, what are your impressions/experiences of Xochimilco? = Viajeros, ¿cuáles son sus impresiones / experiencias de Xochimilco? Any recommendations? = ¿Alguna recomendación? In the Náhuatl language of the Aztecs, the name Xochimilco means ‘garden of flowers.’ The flowers that lined the streets of the city and its rooftop gardens took root here. 500 years ago Xochimilco was the agricultural hub of Tenochtitlán, a metropolis of 235,000 inhabitants. There are two main parts to Xochimilco – a traditional area and an ecological park north of town. Both areas offer excellent bird watching. The canals and lagoons attract bulrushes, ducks, herons and egrets. We recommend the more touristed canals which are lively — particularly on weekends. Brightly-colored and squarish boats (trajineras) carry up to a dozen passengers. Families visit the park en masse and board the gondolas. There are always plenty of vendors (in smaller canoes) with food and drink, souvenirs and music. Hire a floating mariachi band — there is a special price for three songs! Xochimilco became recognized as a tourist attraction in its own right in the 1920s. European guidebooks romanticized the gardens and described Xochimilco as the Venice of Mexico. I wonder if Venice is ever described the Xochimilco of Italy? Today the Xochimilco delegation depends on the influx of visitors for employment from the musicians to the cooks to the craft vendors. As testament to the site’s historic value, UNESCO declared Xochimilco a Cultural Heritage Site in 1987. Visits can assist local environmental conservation efforts. If you are taking a trip from the Nuevo Nativitas or Caltongo landings, ask your boatman to take you to the Apatlaco Canal where one family has set up a breeding area for the axolotl, an endangered salamander (pictured here). Contributions to support this work are encouraged. The International Union for Conservation of Nature includes the axolotl on its annual Red List of threatened species. As in centuries past, canals surround raised agricultural fields called chinampas. Since the Valley of Mexico was originally wetlands, the chinampas were the most productive means of agricultural production. Between the eighth and tenth centuries, seven Nahua tribes arrived in the Valley of Mexico. The Xochimilca people founded their city at the southern tip of the valley. Another tribe, the Aztecs (or Mexica), founded Tenochtitlán and the Aztec empire farther north. Soon after the Aztecs’ arrival, they conquered the Xochimilcas, whose agricultural fields, or chinampas, were used to provide the food for the growing Aztec empire. Today the D.F. encompasses the once-distant cities. In the early 1500s, before the Spanish conquest, chinampas covered nearly 9,000 hectares (22,230 acres) on Lakes Xochimilco and Chalco. Each hectare (2.47 acres) could feed about 20 people, thus supporting most of Tenochtitlán’s residents. When the Spanish arrived, they began to drain the lake bed. Today’s canals are the deepest of what was a much larger system. What was the proud agricultural hub became a neglected garden. Hundreds of years later, in the 1970s and 1980s, it became a depository for the city’s waste waters. The many freshwater springs that once fed Lake Xochimilco were successively diverted to provide a water supply for Mexico City. More than two-thirds of the fields cultivated in the 1930s have been paved over by streets and homes. Most of the water that reached the canals was contaminated by residential or industrial pollution and could not be used for food crops. The chinamperos chose to increase flower cultivation instead, using discarded oil cans filled with organic muck from the bottom of the canal. The area has suffered from environmental neglect. The chinampas should not be seen as mere historical artifacts, but as living examples of alternative agriculture. Farmers continue to scrape muck and organic debris from the canals, using the muck as fertilizer for the agricultural gardens. They harvest chilicastle, the plentiful, shiny blue-green algae that grows on the water’s surface to help maintain the soil’s fertility. Chinampas are formed by alternating layers of aquatic weeds, muck, and earth packed inside rectangular cane frames firmly rooted to the lake floor. You may hear them called floating gardens, but the term takes poetic license with the truth. Trees are planted along the edges of the fields. Their roots have long anchored the beds securely to the lake bottom. LOCATION — Xochimilco is in the southern part of Mexico City about 23 kilometers from the Zócalo. TRANSPORTATION — Take the metro (blue line #2) to the Taxqueña station and then take the light train (tren ligero) to the end of the line and the Xochimilco stop. From downtown, this trip takes between 60 to 90 minutes. From the Xochimilco train stop, you have a few options. There are several boat landings (embarcaderos) within walking distance including the Fernando Celada, Salitre, Caltongo and San Cristóbal landings. Or take a taxi to the Nuevo Nativitas landing. COST — Access to the canals is free. Rides have a modest cost. You can rent a blue-roofed boat (which accommodates up to a dozen people). The larger green-roofed boats run a bit more. This is quite economical if you are traveling in a group. There are also shorter 30-minute rides. FESTIVALS — The annual Xochimilco Festival is held two weeks before Easter and dates back to precolonial times when Mexicans honored the goddess of flowers (Xochipilli) and the goddess of dance (Maculxochitl) to ensure good harvests. Every year, a young woman is crowned La Flor Mas Bella del Ejido (the most beautiful flower of the land) who presides over colorful parades on flower-decorated barges along Xochimilco’s famed canals. FOOD AND DRINK — There are floating food services in the more touristed areas of the canals. The Nuevo Nativitas market has several modest restaurants as well as an aisle of insistent meat sellers who offer samples of carnitas. NEARBY — Nearby Dolores Olmedo Patiño Museum, at Avenida México #5843. Set in a colonial hacienda from the 16th century, this museum contains one of the finest collections of artwork by Diego Rivera and Frida Kahlo. The collection includes 145 works by Rivera, including 24 paintings of sunsets that he painted from Olmedo’s summer home in Acapulco, where he retreated before his death from cancer. There are 25 Kahlo paintings, the largest collection of its kind in Mexico. The hacienda’s dozen drawing rooms with ceiling vaults are now the exhibition space for pieces including Emperor Maximilian’s silver dining set and engraved Palenque conch shells. The museum opened in 1994, and is located just south of the Periférico. The museum is two blocks south of the Noria metro stop. Open Tuesday-Sunday. South of Xochimilco is the town of Milpa Alta, which holds a fair in May and June commemorating the noble nopal (prickly pear cactus). The cactus is inextricably linked to the founding of Tenochtitlán. The fair displays a variety of nopal products, including fruit and the cochineal dye.